We also have a 1st vet category for both male and female and they are awarded £10. Flat and fast course through Capenhurst Village (near Ellesmere Port). Close to the M56 motorway. 2019 entries now open at Nifty Entries! Well done to our previous Winners! Parking will be at the same as last year, at Capenhurst Technology Park, Capenhurst, Chester, CH1 6EH. 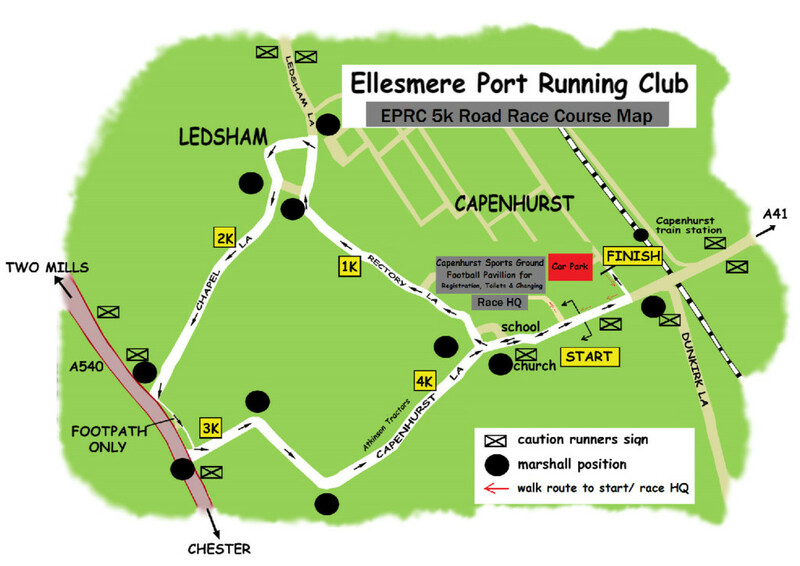 Race HQ is a short walk towards the start and is located at the Capenhurst Sports Ground at the Pavillion, Capenhurst, Chester, CH1 6HE where race numbers & timing chips are to be collected from. Prizes for 1st, 2nd & 3rd Open male and female and 1st place in Vet Categories and additional prize for new course record. There will be drinks and goodies at the finish line with refreshments available at the race HQ. Entrants must be 13 and over on race day. Entry cost is £10 for UKA Affiliated Runners and £12 for non-UKA affiliated runners. There will be no entries on the day. Very nice course, unexpectedly rural, great to have a time chip, excellent and very friendly marshalling. As I managed a season’s PB and over 85% against world standards, this proves what a good course it is. You might consider publishing that stat for each runner if you can figure out the calculation – parkrun do it of course. I’m sure that you are a PB magnet. My only criticism is that the finish line should be a bit wider to accommodate sprint finishers who may be racing each other. However, an otherwise perfect race, nice scenery, well organised and completely flat. Enjoyed the race, a good turnout too with all standards, fast pace so definite pb potential. A good benchmark for me as there are lots of races here and it’s very close to home. maybe a little pricey for such a short race with no gift. Well organised race, very well marshalled and they gave lots of encouragement along the route. Good turn out too, just right for a midweek race. Looking forward to next years.